WARNING: This is a bit of a read, but could save you time and cost. One of the enormously enjoyable facets of my work as a full-time SEO practitioner is that I get to work in many different industries. In the early stages of an SEO project, I typically need to do a deep dive into the industry’s competitive structure and the personas who buy from suppliers within a given sector. This helps to reveal the search behaviours and intentions of these buyer personas in a way that can be directly targeted and engaged by my client companies using organic search. Thankfully I have effective processes and methodologies which I use to engage these activities. I know that I can rely on them to help identify the paths that are both viable to implement and which are most likely to lead to direct prospect engagement for my clients. ODE TO THE CUSTOMER WHO CHOSE PRAXISNOW SECOND! That’s great for client companies who come to me with green-field SEO challenges where I am with them from the beginning . More often than not however, the reality is a little different. Many of my customers come to me having first been “burnt” by bad SEO experiences. To some extent these “bad” experiences may be somewhat understandable given the nature of Google’s ever-changing organic placement algorithm and the moving emphasis on different aspects of SEO at particular times. That being said, even when this is considered, it is truly shocking to discover what some SEO agencies have claimed as best practice SEO and were not shy about charging professional fees for the pleasure of implementing it! In some cases, their practices are up to five or more years out-of-date – and for those who know, I don’t just mean keyword tags! Poor choice of Content Management System (CMS) leaves clients with both hands hand-cuffed when it comes to future SEO. This, despite having been sold the CMS as “best in class”. Perhaps this was so from a technical website development perspective, but if SEO was not fully considered at the CMS decision stage, then I would suggest that this is a failing of the agency – not the client. Use of traditional website development practices which either suited the Agency’s development methodology, or failed to consider the SEO impact of certain development decisions. There has been so many cases where basic SEO considerations were ignored when building even the simplest of websites. Whilst it is often argued that the skills of website development and SEO are mutually exclusive, I don’t buy that when it comes to the basic principles of search which I would consider core to the required skill-set of those who get paid to build websites. Black-hat SEO (tricking Google) was a dangerous SEO tactic and always ran the risk of banishment from the search results. Google has always had a good definition of what it sees as “black-hat”; “if you were asked how this particular activity served your website visitor, how would you answer it? If your answer clearly articulated the visitor value of a particular action, Google was typically OK with it”. If you could not, then the tactic should be avoided. And yet so many SEO agencies continued to build link spam because the “effect” was seen to outweigh the “cause” without due regard to the future consequences of being exposed. So, on a personal level, I absolutely do not excuse link spam on the basis that every good SEO practitioner knew the risks – and yet, those who practiced it, risked their client’s business – in the hope that they would never be caught. Since 2005, not one of the hundreds of SEO customers I have engaged has suffered a manual penalty as a result of their SEO activities. So why should I accept it in the case of others? You shouldn’t either. One might argue that this is easy to say in hindsight, but reality suggests that Google consistently gave the heads-up on this risk year after year after year. The fact that Google’s algorithm has caught up with it, does not excuse the risk that SEO agencies took with client websites when they knew well that such activities could never be long-term or sustainable. No ifs, no buts – they knew – but they also believed that it was the only way they could get results because “everyone else was doing it”. Not so – just look at the ones who were not penalised. EDITING META TAGS & SUBMITTING TO GOOGLE? Contrary to what many believe, SEO is not about editing “meta tags” or “submitting” a website for Google to index. Such things are literally minutes work and by themselves go a very small way indeed towards improving a website’s organic search presence. Doing these things is simply inadequate and barely begins the process of website search engine optimisation. Just because an agency offers them does not in fact mean that the agency is competent in SEO. So if you’ve paid for this, did you get value for money? CONTENT IS KING – REALLY? The “content is king” merchants! This one particularly hit some of my larger clients, where their digital agencies heavily promoted the idea that content is the beginning, middle and end of digital marketing, let alone SEO. In itself, content for the sake of having lots of it, is potentially the greatest waste of time and resource sink for many organisations. Understanding what quality content is and, even more importantly, understanding how it can be leveraged in search (and other channels) is a major knowledge gap in the digital market. What specific content is needed, when it is presented, the contextual value it contains, how it is distributed, its targeted buyer persona, their stage in the buyer cycle and your micro-level sales process are each individual drivers of quality content. How it is deployed determines its ability to independently generate “value” for you, e.g. in the form of a generated sales lead perhaps. This is content in the form of a digital asset – the only context in which content can indeed claim to be king. And yet, few organisations – indeed, few agencies know how to direct your content strategy in this way. SO YOU THINK SEO IS A MYSTERY? Unnecessarily shrouding the SEO contract component in mystery and hiding behind an otherwise understandable “no guarantees” claim. SEO agencies claim no guarantees because of (1) Google’s ever-changing algorithm, and (2) competitor initiatives which cannot be anticipated. However, the flip-side and very often concealed side of this is that (1) SEO strategy must be transparent – what you are doing and why you are doing it is clear to the client, and (2) the definition of achievable results within the context of the chosen SEO strategy can in fact be guaranteed. So many of my clients were effectively duped into believing that they had to pay handsomely for a ticket in the lotto that is SEO. In summary, the rule-book of SEO has been radically re-written recently and the evidence out there suggests that the vast majority of agencies have not in fact realised this yet. Yes, they will talk about things such as Google’s Hummingbird, semantic search and such like, but few are capable of revealing to their clients how they can align to the new paradigm, what the new rules are and how they translate to sets of digital marketing actions that deliver results in a specified way. 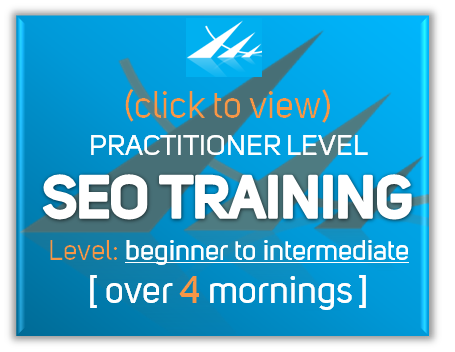 If SEO is on your radar and if full transparency is something you believe in, take a serious look at the PraxisNow Certified SEO Practitioner programme. It consists of eight mornings over eight weeks. The format is a highly interactive round-table group of eight companies, each with the same goal as you. At the end of it, you will be capable of either executing directly or driving a third party to deliver short, medium and long term SEO results in a way that is sustainable, safe and effective. Based on the experience of every one of the groups so far, I can assure you that you will greatly enjoy it, be astounded by the amount of important SEO-related knowledge that you did not know and you will feel empowered to take on any SEO challenge your company may throw at you. Looking forward to having you in the next group!